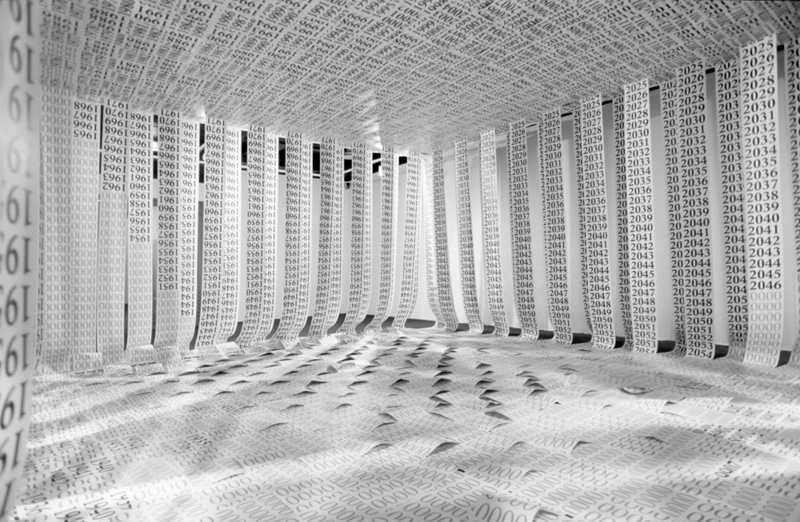 This installation was constructed out of forty five 18 m long paper strips with laser printed dates on them. The strips are woven together, and function as a ceiling. They hung freely as walls, and were woven together to make a tapestry-like floor. This is a kind of closed circuit of parallel times. The audience were welcome to enter the room. The turn of the last century is an important reference for this work. It was created and exhibited in the year 2000. However, this work evokes bad memories. The starting point is very personal, but was processed very conceptually by me. The installation was dedicated to my father who died in 1999. One of the strips showed the length of his life on earth. When I held the exhibition, my mother was sick. During the installation of it, I saw one strip that began with the year 1943 (it was a coincidence that the strip began with the year of my mother’s birth). Dates on her strip ended in 2054, and I thought that my work is a covenant with great powers and will guarantee my mother's long life. She died two weeks after installation was assembled. The artwork was turned into a memorial, but also into my enemy. In this work and in reality, two lives were interwoven: that of my mother and my father. But the seemingly long life of my mother conceptualized by the installation did, in fact, last 29 years less than the father´s in real life. This installation has never been exhibited again. Anyway, I'm done with time as an overarching theme, although I am not finished with death. Passing Understanding is a natural response to the turn of the last century and all the atmosphere of uncertainty regarding the future of human life dependent on technology. The installation is about the existing system of dates that we are forced to live with, from the first date of birth. Behind this system are invisible parallel lives that cannot be measured / counted / compared. The strips contain long and different periods of time. All periods are the result of a calculated geometric approach except one, which is a concrete human life span: that is, my father’s length of life. This is the only “organic time” in this time machine of calculations. Before I arrived at the idea of the interwoven room, I made a long strip with years because I wanted to see how the length of the life of my father could be visually obtained in this way. I copied and duplicated the strip many times on a small scale. Because of the practical transformation of two-dimensional strips into a three-dimensional space, the past years are upside down, while the future years are in the normal direction. I did not plan this, but I think it helped to create greater opportunities for reflection on the linearity and even circularity of time. The installation floor was damaged by visitors (unfortunately I did not photograph this). But perhaps this added credibility to the work. In an ironic sense, the work itself became a victim of time. Picture 1: To the left is the strip of years that illustrates my father’s life span. 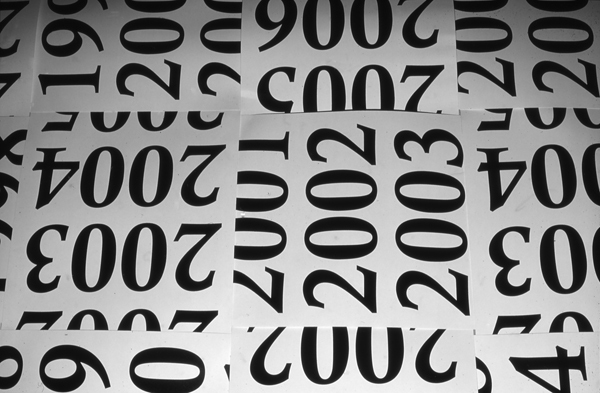 The other strips are identical and the year 2000 is in the middle of each length. 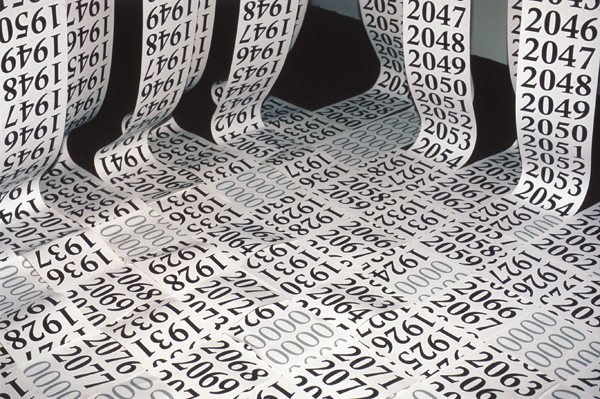 When all the strips were written on a computer, the computer’s sorting logic changed the order of the strips. I accepted this mechanistic approach since the process was fundamentally formalistic and instrumental from the beginning. I wanted this cold, anonymous and mathematical visual language which could hide my “organic secret”: that is, the length of real life. This illustration shows the two half circles of strips that were woven together. The area which is densely filled with the years is the ceiling of the room.